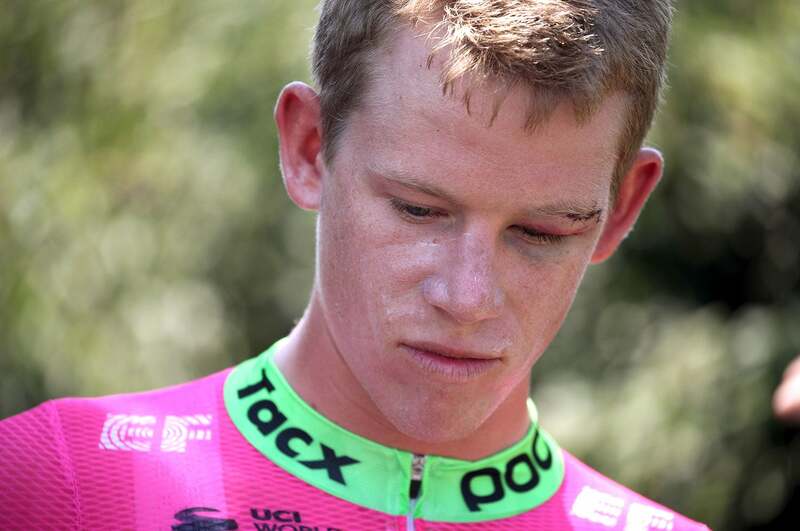 American Lawson Craddock crashed hard in stage 1 and broke his scapula. He has vowed to press on. LA BAULE, France (VN) — The Lawson Craddock story is going global. 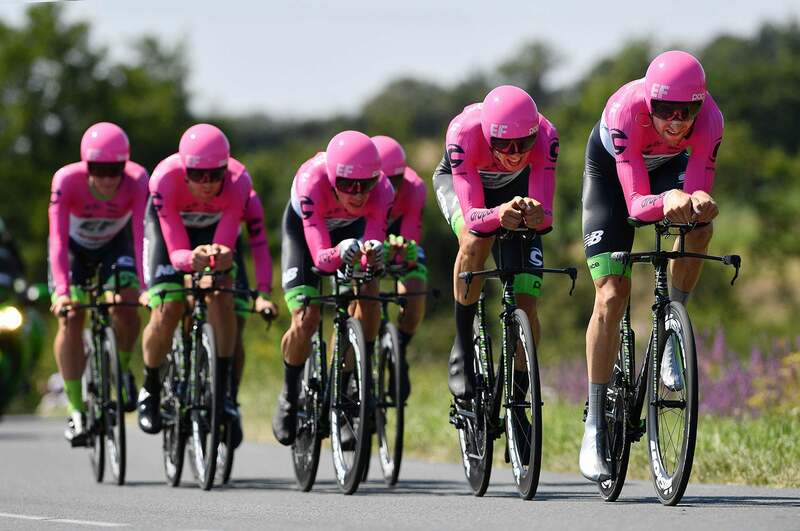 The humble, hard-working Texan is rarely in the international media spotlight, but the EF Education First-Drapac rider stepped off the team bus to a gaggle of international media waiting for him at the Tour de France. “Are you a hero?” asked on French journalist. “Are you superstitious?” asked another, in reference to Craddock’s No. 13 start bib. Craddock did his best to answer the questions and delivered a few gems like, “I was raised Texas tough.” The journalists gobbled it up, and just as quickly they trundled away. 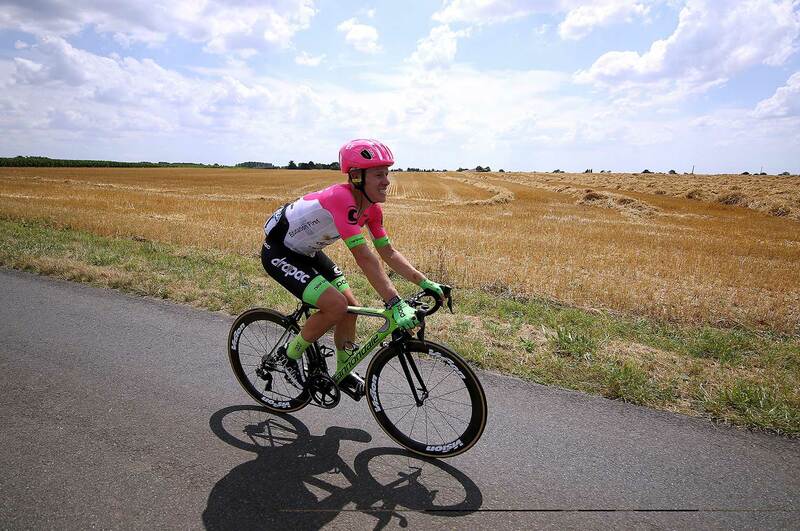 Craddock might find himself the center of attention following his heroic bid to stay in the Tour in the wake of his bloody crash on the opening stage, but it’s been the work of the entire EF Education First-Drapac organization to keep him in the race. “Project Lawson” is a morning, noon and night effort. Behind the scenes, doctors, chiropractors, soigneurs, mechanics, and teammates are all pitching in to help Craddock stay in the Tour. Craddock has been struggling to keep pace each day, but he’s managing to hang in there. The cycling cliché of taking it “day by day” has been reduced to an even more granular level. Every hill, every corner, and every kilometer become the next benchmark. Just hours into his second career Tour start, Craddock crashed heavily in the feed zone of stage 1. He apparently struck a water bottle on the road and fell on his face, back, and shoulder. The cut to his left eyebrow is what caught the attention of the TV cameras. That image of the stoic cyclist struggling to fight to the end was in sharp contrast to Brazilian soccer star Neymar rolling on the grass following a tackle in the World Cup. More serious is the small fracture on a ridge at the top of the scapula that is causing Craddock more trouble. EF Education First’s effort to nurse along Craddock began moments after his crash. Team staffers immediately gave him a once over as he remounted his bike in the aftermath of the impact. Bleeding from his brow in images that went viral, Tour de France race doctors examined Craddock and were feeding information to Sprouse waiting at the finish line. The Tour doctor determined Craddock’s health was not in danger and he did not show symptoms of a head injury, so Craddock was able to push on. Once across the line, Sprouse immediately reviewed Craddock’s injuries more thoroughly and paid special attention to any signs of a concussion or serious head injury. There were none, and Sprouse could move on to recovery mode. There was one more thing: Craddock had to undergo a random anti-doping control at the line. Even as he was bleeding and in pain, Craddock went straight to anti-doping before visiting another Tour doctor in a mobile trauma unit waiting at the line. 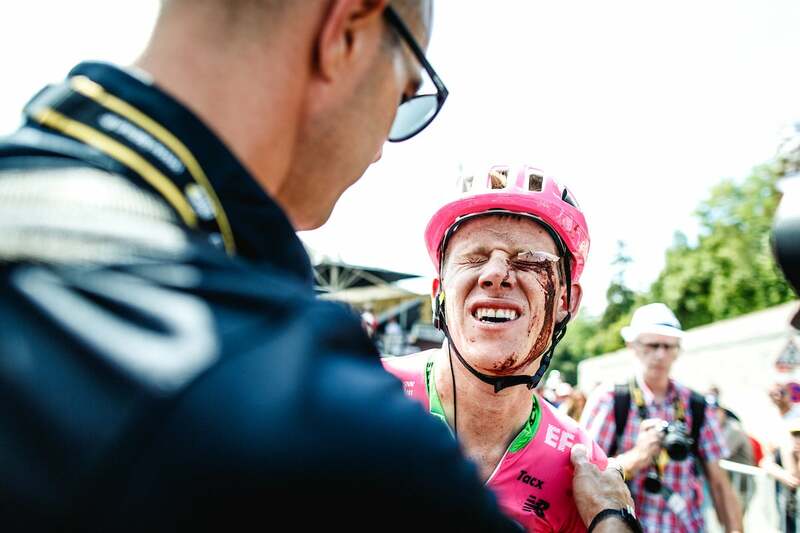 After confirming news of a fracture, Craddock broke down in tears at the finish line when he considered that he might have to abandon the Tour after its first stage. The salve? The team stopped on the way to the hotel so Craddock could have a hamburger. Another key member of Craddock’s support system is team chiropractor Matt Rabin. His work with Craddock began the night of the crash. With the muscles knotting up around the traumatic injury, losing mobility is another worry and Craddock’s primary source of pain. Rabin has been digging deep into Craddock’s shoulder several times a day. After a restless night, the biggest question mark was whether he could start Sunday’s second stage. Sprouse deemed surgery wasn’t necessary, so Craddock woke up Sunday morning determined to at least try to start the stage. Rabin worked Craddock’s knotted muscles and he did a warmup on the rollers. With his shoulder taped up and stitches over his brow, Craddock got on the bike for a test spin. The challenge became managing his pain. Craddock’s resolve to stay in the race is balanced with medical and safety concerns. 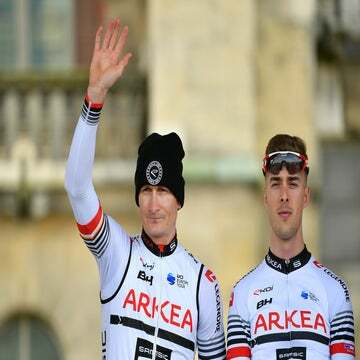 Sprouse said Craddock was given the green light to continue in the Tour only after it was determined that his health and the safety of Craddock and others in the race would not be imperiled. 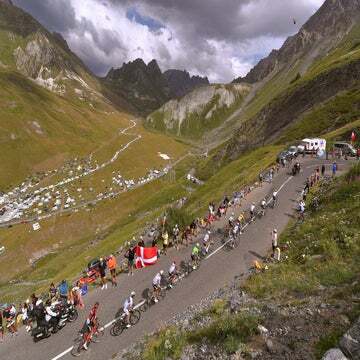 Imagine the pain of racing the Tour de France with the equivalent of a cracked rib, but on your shoulder. The pain is a constant companion. Craddock perilously dangled off the back of the bunch Sunday but survived to the line. Monday’s team time trial stage presented a more delicate challenge. It’s a brutal discipline and one that an injured rider is at once a handicap and a loss. Even with a 30-percent time cut, there was a risk that Craddock would have been eliminated if he lost the wheel early and was forced to ride alone the entire stage. A similar scenario played out for Ted King in 2013, when he also crashed on the opening day and was later dropped in the TTT. He missed the time cut by seven seconds and was eliminated. Craddock said the TTT position actually felt better because his elbows carried some of the weight. He ultimately survived another day. If riding to stay in the race and help team captain Rigoberto Urán isn’t enough, Craddock has found another inspiration. Craddock’s journey to the Tour de France began more than a decade ago on a concrete outdoor velodrome in Houston. His first taste of bike racing came on those slabs, but the velodrome suffered major damage during Hurricane Harvey in 2017. When he was laying in bed the first night after his crash, Craddock reflected about his cycling journey to the Tour de France. A light went on about how he could help his hometown velodrome. Craddock personally vowed to donate $100 for stages he finishes and asked the public to match his efforts. By the end of Wednesday’s stage, more than 500 have pledged to help and he’s already raised nearly $40,000. All proceeds will be used for repairs to the velodrome. That decision is also giving Craddock an extra tailwind as he fights through the pain. Everyone has started calling him “Awesome Lawson.” Crashes are part of any Tour — on Wednesday, Tiesj Benoot and Robert Kiserlovski both left the race due to injuries — but something about Craddock’s grit and fortitude has struck a chord. On Wednesday, Craddock finished dead last, but it felt as if it was a victory. Every day he is feeling slightly better. Sunday’s cobblestone stage will present a new challenge. The first rest day is the new goal. In the meantime, it’s massages with Rabin, check-ups with Sprouse, and support from the rest of the team. Craddock is hoping to survive one more day, and then start the whole process over again.